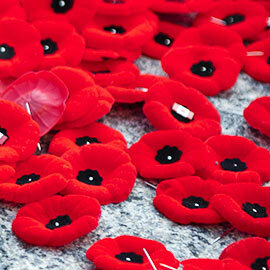 Waterloo – Remembrance Day is Sunday, Nov. 11. Mark Humphries, associate professor in Laurier’s Department of History, Dunkley Chair in War and the Canadian Experience and director at the Laurier Centre for Military Strategic and Disarmament Studies, is an expert in Canadian military history, the First World War, and war, trauma and health. He can be reached at mhumphries@wlu.ca or 519-884-0710 ext. 3309. Peter Farrugia, associate professor in Laurier’s History and Society Culture & Environment Programs, is an expert on 19th- and 20th-century Britain and France, particularly the study of war and peace. Farrugia is available to comment on history and memory as it relates to the First World War. He can be reached at pfarrugia@wlu.ca or 519-756-8228 ext. 5707. Timothy Donais, associate professor in Laurier’s Department of Global Studies, is an expert in peacebuilding, peace and conflict, and complex war-to-peace transitions. He can be reached at tdonais@wlu.ca or 519-884-0710 ext. 3295. Kandace Bogaert is an assistant professor and Cleghorn Fellow in War and Society in the Department of History at Wilfrid Laurier University. She is an expert on the history of health and disease, especially during the First World War. She has studied soldier deaths by flu and suicide during the Great War, as well as the long-term consequence of war trauma. She can be reached at kbogaert@wlu.ca or 519-884-0710 ext. 4944.